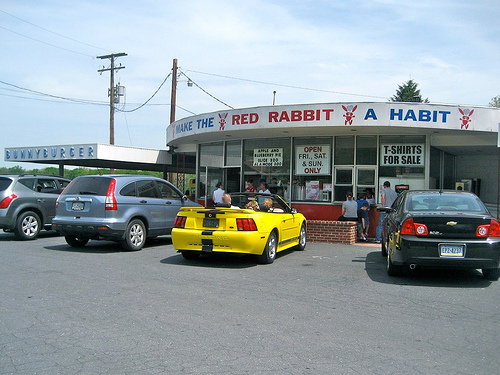 "The Red Rabbit Drive In – A Drivin’ Destination in Duncannon PA"
It’s a perfect night / weekend for a retro road trip, and the Red Rabbit Drive-In is a drivin’ destination for sure! Located in Duncannon, PA and opened on Mother’s Day of 1964 the restaurant is still family owned and operated by the daughter and son-in-law of the original owners. Only open Friday, Saturday and Sundays, Retro Roadhusband and I used it’s drive-in allure as an excuse for a roadtrip north of Harrisburg on a sunny Saturday. We weren’t the only ones who made the unexpectedly sharp right hand turn off the busy road into the parking lot that day, and because we had just spent a while in the car we declined the car hop service and opted to eat at one of the picnic tables under the overhangs. 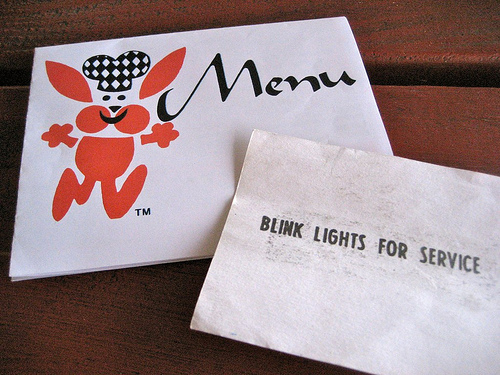 We sat under the Bunnyburger side ( in the left of the above photo) and a friendly waitress came right over to hand us menus. 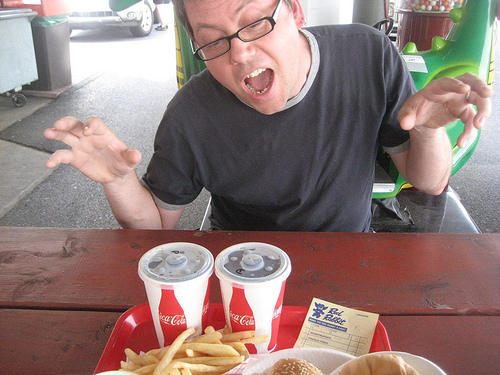 Since I saw the Bunnyburger advertised, I ordered that, and Retro Road husband got the pork BBQ sandwich. Total bonus waitress points for her hearing us discuss sharing our sandwiches and offering to have them cut in half! Many of the favorites on the menu have been there since opening day, and next time I’m going to have to order the “Perry County Half Chicken” just because of its band name – ladies and gentlemen, the Disjointed Half-Fryers! I am a definite fan of the Bunnyburger which is a “Ground Beef Patty, Hickory Smoked Bacon, Melted Cheese, Shredded Lettuce, Tomato Slices, Pickles, Onions and Our Own Sauce, served on a special seeded roll” – yummers! 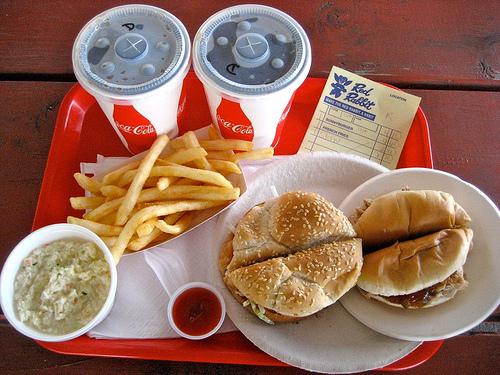 I’m told by WendyVee over at Roadside Wonders, that what makes their fries so tasty is “Bunny Dust” – go figure! We were too full for the ice cream and treats that are also on the menu, but we did put a few quarters in the vintage pinball machines on the other side of the building. 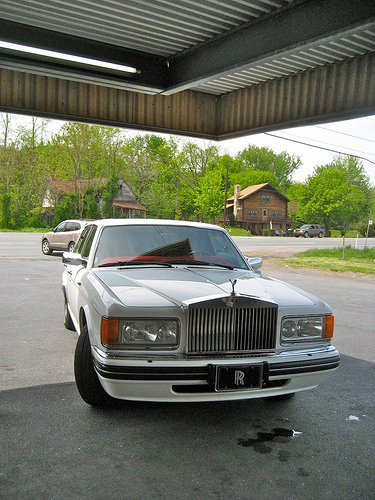 And as you can see, Retro Roadtrip types come from all walks of life, as noted by this swanky Rolls Royce pulled up under the awnings. I don’t know if they have any Grey Poupon on the menu, but poppyseed rolls can be had for an additional 35 cents. 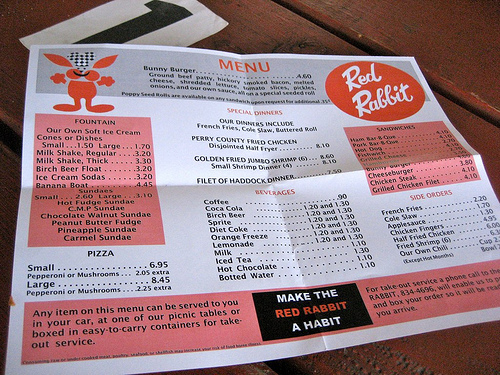 What I will say, is even if they’re only open 3 days a week, I can see why the Red Rabbit can become a habit! Copyright © 2010 Retro Roadmap.com. All rights reserved.